Business Loop I-15 at the city of Norco constitutes a 2.3 mile route west from Interstate 15 between Exits 98 and 100. Nearly unmarked due to the removal of signage, the loop follows Second Street west to Hamner Avenue north and Sixth Street east. California 31 (Hamner Avenue) was the original designation for Interstate 15 between California 91 at Corona and I-10 at Ontario. It was also once known as Temporary I-15 before the freeway opened to traffic. The state route designation was decommissioned when I-15 was completed as a freeway along this stretch in 1989. Hamner Avenue was subsequently returned to local maintenance and the Business Loop I-15 designated. A lone trailblazer remains along the Norco business loop for I-15 as of 2017. The assembly stands at Sixth Street and Hamner Avenue. Photo taken 10/13/12. A Business Loop I-15 trailblazer formerly posted along the northbound off-ramp (Exit 98) from I-15 to Second Street. This assembly was removed by 2011. Photo taken 08/12/08. 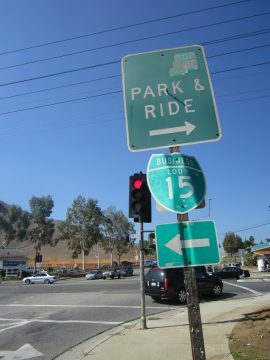 Long since removed, this reassurance marker for Business Loop I-15 was found along Hamner Avenue (old SR 31) north after 2nd Street in Norco. Photo taken October 2000.
Business Loop I-15 turned east onto Sixth Street to rejoin Interstate 15 at an adjacent diamond interchange (Exit 100). Photo taken 10/13/12. Business Loop I-15 overlays Sixth Street (Norco Drive) west from the southbound off-ramp at Exit 100 to parallel Hamner Avenue south. Photo taken 10/13/12. A faded shield directs Business Loop I-15 south onto Hamner Avenue from Sixth Street near the Interstate 15 Park and Ride in Norco. Photo taken 10/13/12.